Let’s play a game of word association. First word, Cervélo. The following word could be any number of adjectives or phrases, but most likely are aerodynamic, expensive or Garmin — the team famous for riding Cervélo bikes (until the end of the 2014 season). Aerodynamic? Well, Cervélo paved the way for the rise of the aero road bike. Expensive? It’s relative, of course, but in the case of the new P2, Cervélo’s entry-level time trial bike — is there really a more impressive bike that costs less? Over the last few years, some of the world’s best performances against the clock have been aboard a Cervélo. In 2006, Fabian Cancellara won the first of his four World Championship time trial titles on his CSC team issue Cervélo P3, beating second place and CSC team-mate David Zabriskie, who was also riding a P3, by over a minute. More recently, Ryder Hesjedal wrapped up victory at the 2012 Giro d’Italia with a 28.2km TT in Milan. He was riding a Cervélo P5. This came after the whole team, all riding the P5, took to the top step of the podium after winning the team time trial on stage four in Verona. Brushing over Garmin-Sharp’s TTT performance at the 2014 Giro, it’s apparent that the word Cervélo goes with aerodynamic, as aerodynamic goes hand in hand with time trial. The trickle-down effect is constantly in progress. The pricy top end gets the best bits each year, and once the new ideas are superseded, they find their way down the ranks. The Cervélo TT range, which started out on the P5, has found its way to the P3 and now the new Cervélo P2 time trial bike. This hasn’t happened in a season. The overhaul to the latest version of the P2 is the first significant change to the model in seven years, so it’s fair to say that it’s long overdue. But good things come to those who wait, or so we’re told. It’s a big change: the P2 now has an almost identical frame shape as the P5. The only differences are that the rear brake on the P2 is on the seatstay, rather than underneath the frame as on the P5, and the top tube joins on to the seat tube. This new P2 is essentially the 2014 P3 frame. It uses the same grade of carbon, and an identical layup, but it has a fresh new look in keeping with Cervélo’s latest aesthetic. It does, however, house a different fork to the P3. The P2 fork is thicker at the top of the blades, by about 4mm, which reduces cost when compared with the P3 fork. It weighs the same and it’s just as stiff, but the pay-off is that aerodynamics may suffer; how much, Cervélo can’t say. wind tunnel — one of the small savings that was made to lower cost to the consumer — but since the frame is the same as the P3’s, there would be only a small difference, if any. The added frontal area on the P2 fork is positioned behind the brake caliper, so any difference would be unmeasurable. The P2 has inherited a number of performance-enhancing aspects, as well as the frame shape, from the P5, one of which is Cervélo’s aero cable management, meaning the cables all run internally through a neatly designed entry port on the top tube. This part of the frame future proofs the P2, making it fully compatible with mechanical, hydraulic and electronic components. Furthermore, the P2 has the P5’s dropped down tube. This element reduces the gap behind the front wheel and the frame to minimise drag. Another feature, also found on the P5, is the extended seat tube cut-out, which functions by shielding the rear wheel more effectively. The aerodynamic upgrade and improvement to the frame’s material has increased speed and stiffness over the last version. The head tube stiffness has been increased by 16.4 per cent and, for the first time, this model features Cervélo’s renowned BBright asymmetric bottom bracket. This increases the frame’s rigidity by 6.5 per cent, making it more effective at turning rider power into raw speed. Another of the changes from the old version can be found in its geometry. This new shape has a shorter reach and taller stack, making it far easier to ride than ever before. Cervélo’s new seatpost system also gives the rider more movement fore and aft, again making it easier to dial in a better position. It’s easy to get carried away by the performance of the P2 and forget that it’s supposed to be an entry-level bike — hard to believe after riding it. Mindful of this, and so to meet that lower ticket price, Cervélo has kitted the P2 out with Shimano’s RS10 wheelset and the latest Shimano 11-speed 105 groupset. Although not as desirable as some groupsets, its performance against value is outstanding. A semi-compact (52-36) FSA Gossamer chainset with carbon crank arms ties in the FSA brake calipers. Meanwhile up top, Profile Design makes up the P2 cockpit. 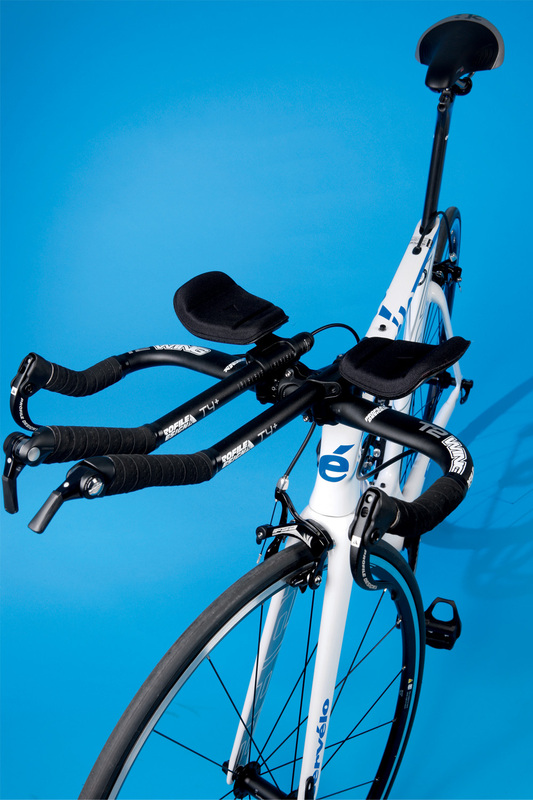 Given the P2 has the same frame shape as Cervélo’s top-tier P5, it becomes the cheapest way to buy into a ‘superbike’. Regardless of its price, its performance is faultless. It has taken Cervélo seven years to transform the P2 to this point, but it’s been worth the wait. A fast machine that rides much better than you'd expect from an entry level offering.